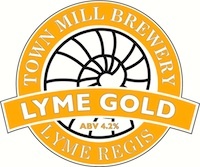 Town Mill’s Lyme Gold | DorsetBreweries.com - A Guide to Dorset Breweries and Dorset Beers! Brewed using Maris Otter Pale Malt together with Cascade and Bobek hops. A pale summer ale. Easy drinking with a refreshing citrus aroma.